The 13,000+ square foot main residence offers everything from a movie theatre, expansive wine cellar, library and 6 spacious bedrooms all with en suite bathrooms. The master bedroom, complete with dual bathrooms and walk-in closets, has its own private outdoor balcony situated perfectly to take in the surrounding mountain views. The large patio area off of the home features an outdoor fireplace with sitting area, a gorgeous custom pool adorned with boulders for diving and plenty of entertaining spaces. The property offers several accessory buildings from a 3 bedroom, 2 bathroom guest house and a large workman’s garage, to one of a kind equestrian facilities with a 10,000+ square foot barn, several grazing paddocks, an oversized arena and fieldstone watering pools. Also on the property is a separate work out studio, 4 car garage, a picturesque tennis court and helipad for easy travel. 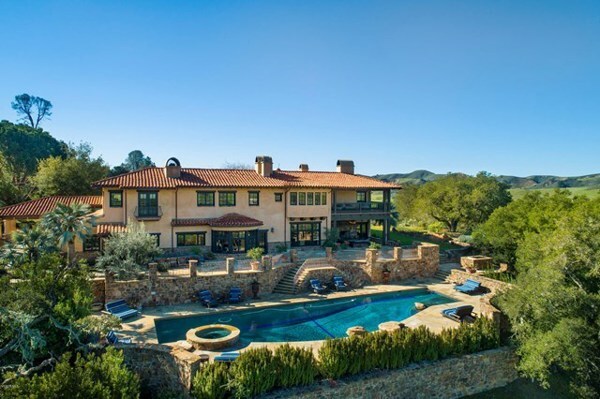 Though not currently being used for agricultural purposes, the property lies deep in the heart of California’s wine country. The soil remains untouched and is asking to be planted with multiple grapes that can be grown in different locations around the property. With two private wells and water cisterns included in the acreage, irrigation for crops is available. Courtesy of Berkshire Hathaway HomeServices California Properties. Disclaimer: All data relating to real estate for sale on this page comes from the Broker Reciprocity (BR) of the California Regional Multiple Listing Service. Detailed information about real estate listings held by brokerage firms other than Outland and Associates Real Estate include the name of the listing broker. Neither the listing company nor Outland and Associates Real Estate shall be responsible for any typographical errors, misinformation, misprints and shall be held totally harmless. The Broker providing this data believes it to be correct, but advises interested parties to confirm any item before relying on it in a purchase decision. Copyright 2019. California Regional Multiple Listing Service. All rights reserved.